More Indo election goodies. The first, well, clearly this guy sees himself as a peacemaker, bringing together, in harmony, two worthy but competing global factions. I'm sure the American people would be keen to to outstretch the hand of friendship to Osama. Remember, these folks have been nominated by their parties to take a seat in the assembly of the 4th biggest nation on the planet. They see themselves as players, if you will. The second guy (it is a guy I think) is clearly running to target the Golkar's potential fetish voter (and there are a few of those amongst the devout, to be sure). 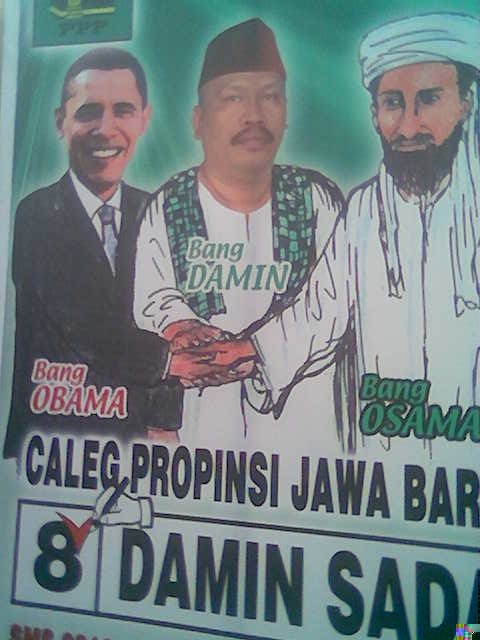 Or the local KKK / Golkar Coalition ticket.